I am building a seaperch robot for a competition and was wondering how these modules would work to control an underwater robot. The competition is in a swimming pool with the max depth of 12 ft, however, was concerned there would be too much signal loss at that depth. I was wondering if anyone has tried them for a similar application or knows how they would work in this situation. What is this, Bluetooth or something? Nope, it uses similar frequencies, but it doesn't use the same protocol. It is written as XBee needs 215mA in 3.3V but I measured max. 50mA working during communication in different ranges. What is the problem? It is wrong info or something is wrong with my circuitry? If I remember correctly, these modules have a power setting register. You can use a utility like XCTU from Digi to check(and set) if your module is set to work at max power or not. Also, which voltage regulator you are using? It should be able to supply more than 215mA. @pertinaks , This is an old thread but I have a similar issue as yours. Did you manage to solve yours? Datasheet numbers say 220mA @ 3.3V , but I measured 60mA max. Because of that I wasn't able to achieve the maximum link range. 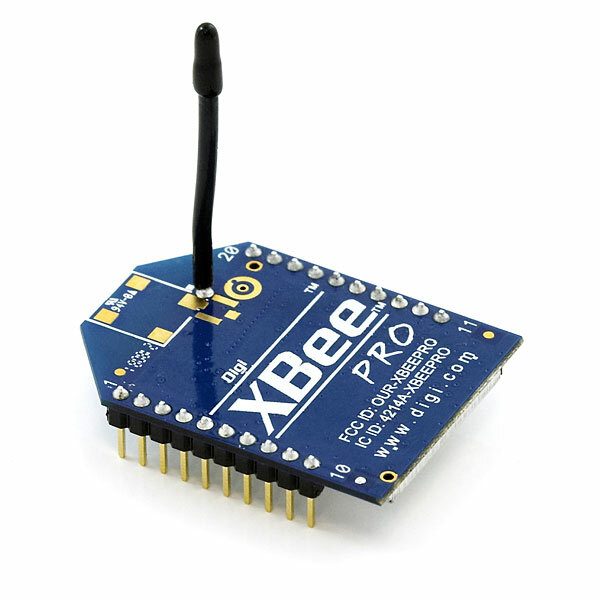 Can I use an XBEE Pro (60mw) to transmit and a standard (1mw) XBEE to receive? Are there any protocol differences - or is this entirely possible. Yes, it works. I was using 2 standard XBEE's with the chip antenna and was not happy with the range. I decided to boost the transmit side with the XBEE Pro and leave the chip antenna on the receiver end. Simple swap and my range issues were solved. Why when you got back 400+ units you reduced the limit to purchase from 10 to 5 per customer? Could I use two of these to transmit and receive an RC signal to control an RC vehicle? I would recommend swapping out the existing controller with one you know as that would be cleaner and you wont end up destroying your working RC unit. is it the internationnal variant limited to 10dbm? Does this product interfere with the 2.4Ghz Futaba Radio??? 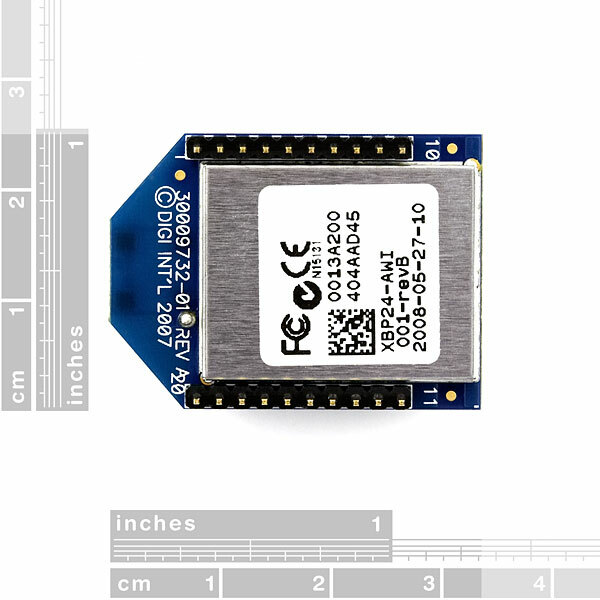 i would like to receive data from 6 dof razor imu and send it to arduino pro mini via xbee, but confused which xbee to buy? can anyone help me out? the range is short range only! Any ZigBEE will do as long as you are able to configure the correct baud rate. I have the 9DoF Razor and it works perfectly fine with my short range (100m) and long range (XBee PRO 900) modules. Just set the UART baud rate of the modules to 57600. I cannot find a replacement wire antenna!? We don't sell replacements. You might want to contact Digi directly, or contact techsupport@sparkfun.com and see what they say. Can I, how do, I update this to use the ZigBee protocol? If I can't does SparkFun sell a ZigBee version? How can I connect it to the PC? Do I need an arduino between the XBee and the PC? Or are there any special wires? If I wanted to make digital walkie-talkies to communicate between multiple people, do you think this would be a good product to use? Or do you have another recommendation? You should flash the configuration using ATWR. These modules used to occasionally lock up when we set the configuration at runtime. After 16 hours of testing with flashed configuration, the problem seems to be solved. Either they're prone to self resetting or they were only tested used flashed configuration. I have found this to be the most useful of the XBee modules. The 1 mW versions just don't transfer data far enough in normal domestic scenarios, walls and what not. For those who are new to this, think of the XBee as a serial connection without the wires. These modules get you a 57600 bps connection through a couple of normal household walls. It seems expensiveâ¦ until you try to do the wiring. And then you start remote programing your Arduinos (FIO recommended)â¦ wow how convenient! The 60 mW XBee with the wire antenna is the perfect starter. Buy two (RX<->TX), download the digi "xctung" and follow the advice on the sparkfun tutorial. Its definitely hacker fun, even superfun, my advice: "just do it". Is this product is already included rx and tx? Can it be used with Raspberry Pi ? Please inform me about that. Is there a way to have two of the XBee Pro modules above used in "direct mode", i.e. as a remote switch using "I/O Line Passing"? There is extensive documentation online on doing this with Series 1 modules... but the ZBee Pro does not seem to have all the necessary commands and can only work as coordinator, router or end-device. And if not, are there any workarounds that do not require a microcontroller or extra hardware? Thanks. how can i configure this product with linux operating system ? hello everybody I received my 2 xbee pro few days ago, and I'm trying to test them, the problem is that I can't run the x-ctu software I got error "Failed to run setup.exe(check to see if this file is in the zip)"
could i use 2 of these xbee's and 2 xbee sheilds and 2 arduinos to hook up several POTs without serial communication to the transmitter arduino and have the receiver arduino translate my POT signals into servo commands? Can you take the wire antenna off and put a U.FL Connector for different antenna. Hi, is it possible to order this device also to Europe, as the 2,4 GHz Tx power upper limit seems to be 10mW here? So is the Tx power adjusted for example via X-CTU software or is there completely separate XBee Pro Series 1 model for the 10 mW limit areas? Cheers! So what sort of wait is expected till there is more in stock? Could the wire antenna be replaced by a RPSMA connector? Can the antenna be easy bent by 90 degrees or would this cause it to snap or otherwise damage the device? I would want to mount the PCB vertically. Yes it is, though you'll need a little space to make the turn. (about 5mm, the antenna is flexible but not very) You can also choose to desolder the antenna and put some flexible wire in between to make the turn. From experience I can tell you that if you 'play' too much with the antenna the solder connection with the board will break. Of course this is easily fixed by resoldering, but ok.
is it safe connect 3.7v to this Xbee? I want to talk between a single mobile unit and a base PC, can I just have one of these on each end or do I need a base station. Where can I get some installation and user guide instructions? My future plan is to host multiple mobile units what will I need to make this work. Product manual above is a great start. The base station is the one connected to the PC - you only need two. Anyone get these to work on Ladyada's xbee adapter? pretty much. This guide should help you configure them so they can talk to each other with the appropiate network ID and transfer speed. Get this rather than the cheaper one with limited range. You won't be sorry, unless you never intend to have your XBee pair out of the same room. Who needs the potential for irritation? Note that they come configured out of the box to work. You can change things if you want later, but play with first rather than confusing yourself with all the set-up guides running around. If you decide to reconfigure, note that there are an older version of the software needed (X-CTU), and a brand new version. I suggest the older version, as most on-line guides seem to refer to that one. You will need a shield if using with an Arduino, and another device if communicating with a desktop via USB -- the USB will provide the power for the XBee as well as the link into your computer. On the Arduino, power comes from it. Note that many of the examples I've seen use the software serial library, which is helpful so that you don't have to worry about unplugging the XBee while uploading sketches to your Arduino. Note that when setting the jumpers on the shield. For communication with a PC desktop, download the free "putty" terminal program. As for power draw, I've run mine on both an UNO, and an Edison -Arduino breakout board from batteries with no issues whatever. I was using a non-Pro Xbee and it was intermittent at the distance I was using it at. The Pro works much better. I've used this radio to get extra range that I couldn't have with a simple xbee holding a ceramic antenna. I was forced to put the receiver in a metal box for my project needs. this did not however hinder a reception at 300 meters range. I had two of the 1mW devices and the range was nothing like claimed. Mind you I am working from a few inches of the ground and the spec is for 'mountain top to mountain top'. So I got these for my AVC entry. I have not figured out the range in my situation, but its at least 300 feet. Very good for my purposes. Everything else works great. Been working with lots of the S1 series using the DigiMesh Firmware. They are just reliable. Reliable, reliable. I have received your products, and work so good. Tutorials are well made, discussion forums are informative too. 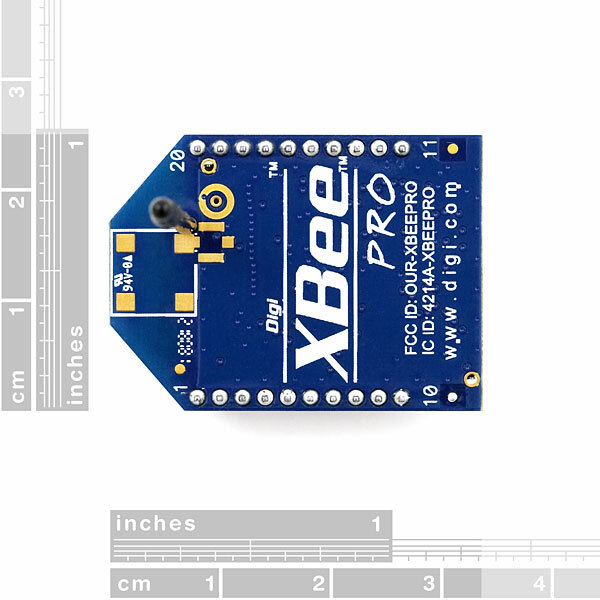 i knew that xbee pro is the most popular GHz module for long distance communication and its very easy to use it.